In 2005, Japanese PV makers dominated global PV production — Sharp, Kyocera, Sanyo (now part of Panasonic) and Mitsubishi Electric represented about 50% of global production. When German and other European markets expanded quickly, a great number of companies in Europe and Asia, specifically China, jumped into the “potentially” profitable PV industry. They rapidly ramped up their production and brought down costs, leaving Japanese companies behind. But when the Japanese government decided to pump life into the lagging domestic PV market, it created a generous feed-in tariff (FIT) program. Japanese manufacturers began enjoying full access to the lucrative domestic market and started to see the improvements in their bottom lines. The PV technology mix in Japan is changing. Domestic manufacturers largely produced poly-crystalline silicon (poly-si) technology, so it dominated the market. However, the Net FIT for the residential market revitalized the domestic market. Since then, the demand for high-efficiency or mono-crystalline silicon (mono-si) modules has gained popularity among homeowners who want to maximize energy production on their space-limited roofs. 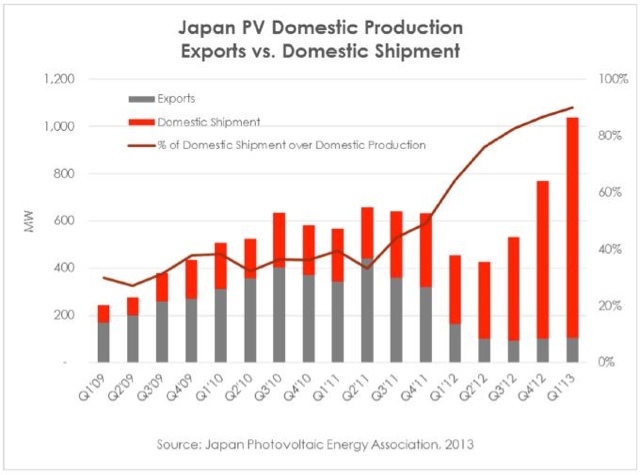 Japan PV manufacturers are expanding their product and service offerings and strengthening their domestic networks against foreign PV markets, which now accounts for more than 30% of the domestic market. Kyocera, Sharp and Solar Frontier have moved beyond “module only provider,” by vertically expanding into the downstream solar value chain, as an EPC contractor, project developer and independent power producer. Solar Frontier have developed around around 100 MW worth of medium-scale PV in Japan. Last year, Kyocera joined forces with IHI Corp. and Mizuho Corporate Bank to construct one of a 70-MW PV project, the nation’s largest, in Kagoshima Prefecture. Is kelp a viable Biofuel? Privatisation of SESB a failure? Apple is throttling iPhone data speed?